Shazam! is Big with superpowers. That’s how the film was marketed, that’s where it succeeds the most, and there’s even a nice reference to that iconic piano scene in F.A.O. Schwartz. Even with DCEU titles like Aquaman finally leaning into the DC universe’s goofier aspects, and proving all the better for it, Shazam! is the franchise at peak delightful silliness. Despite a number of daft CGI moments during the action scenes, this film really nails the childlike power fantasy of being able to transform into a superhero. That wish fulfillment dynamic- Billy Batson’s ability to switch between child and adult hero with a single word- is probably why Shazam, formally Captain Marvel (not Marvel’s Captain Marvel…. it’s complicated), has endured for so long. Sure superpowers come with great responsibility but if you were a kid bestowed with powers, or at least with the ability to look twenty-something, wouldn’t you goof off first? This character has been around since the early 1940’s Golden Age era of comic books, first as a competitor to Superman and later as a part of the DC universe, before getting an origin story overhaul in the New 52 relaunch. Shazam! takes most of its inspiration from the New 52, most notably having its titular hero behave like a teenager in a grown man’s body. Sure, he’s got the wisdom of Solomon, but Shazam can also do tricks with his lightning powers and buy as much candy as he wants from the convenience store. The plot also adheres closely to the New 52 storyline with a few tweaks in the villain department. 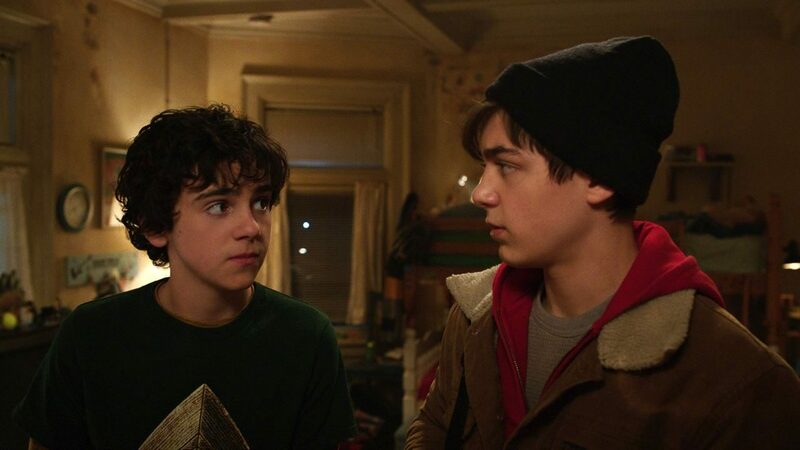 Following his latest-run-in with the Philadelphia police in an attempt to locate his biological mother, young Billy Batson (Asher Angel) is reassigned to yet another foster home. Consisting of parents Rosa and Victor Vasquez, as well as their adopted children Mary, Darla, Eugene, Pedro, and the paraplegic Freddy Freeman (Jack Dylan Grazer), this foster family comes across as genuinely good-natured and concerned about Billy’s well-being. None of those “evil step parents” clichés you’ve seen one too many times at the movies. But Billy doesn’t see much lasting appeal in this family, hoping to reunite with his mom as soon as possible and get out of their hairs. Of course, things are never that simple in superhero films. After defending Freddy from some school bullies and evading them on the subway, Billy is mysteriously transported to a mystical dimension, not located on the train map by the way. Known as the Rock of Eternity, a conduit of all magic on Earth, Billy is confronted by the wizard Shazam (Djimon Hounsou) and warned of a great evil- the literal seven deadly sins- being unleashed on Earth. They were released eons ago by the Council of Wizard’s former champion Black Adam, leaving Shazam to search for an individual “pure of heart” who could altruistically wield his power. In his final moments, the wizard deems Billy his champion, even though his actions don’t necessarily fit the “pure of heart” requirements. 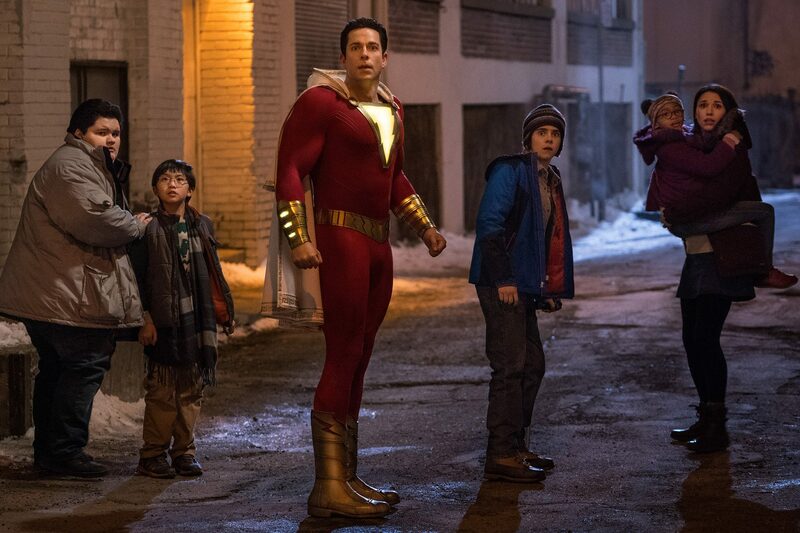 By speaking his name, “Shazam,” Billy transforms into Zachary Levi wearing a red and yellow costume with a white cape and electric lightning bolt insignia. And then the comedy ensues. Shazam! really leans into its inner Big whenever Levi takes the screen as Shazam. He’s a ball of goofy energy who loves using his powers but isn’t quite the expert on superheroism, superpowers, or on what he should name himself. Luckily, that’s where Freddy proves a standout character, coaching Billy on what abilities he might have and how to master them like a comic expert. Grazer and Levi’s buddy comedy dynamic is great and helps ground the film’s silly aspects in an intimate story about family. Just as Billy’s powers allow him to be emboldened after years of being emotionally let down, Freddy’s fixation with superhero culture reflects his self-conscious desire to be noticed beyond a disability. 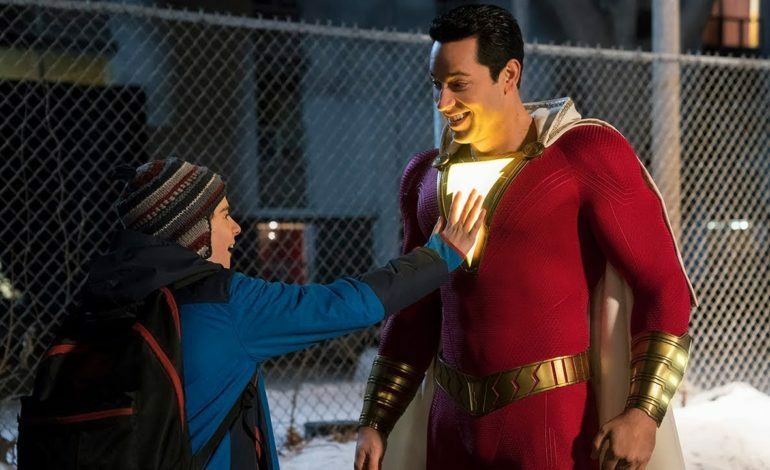 Honestly, Shazam!’s best moments are its Rocky-esque “training montages” where Freddy engineers various tests for Billy to show off his powers, ranging from “leaping tall buildings” to blasting school textbooks with lighting. Given the film’s emphasis on comedy, it can be a bit jarring whenever things shift to a much darker tone. 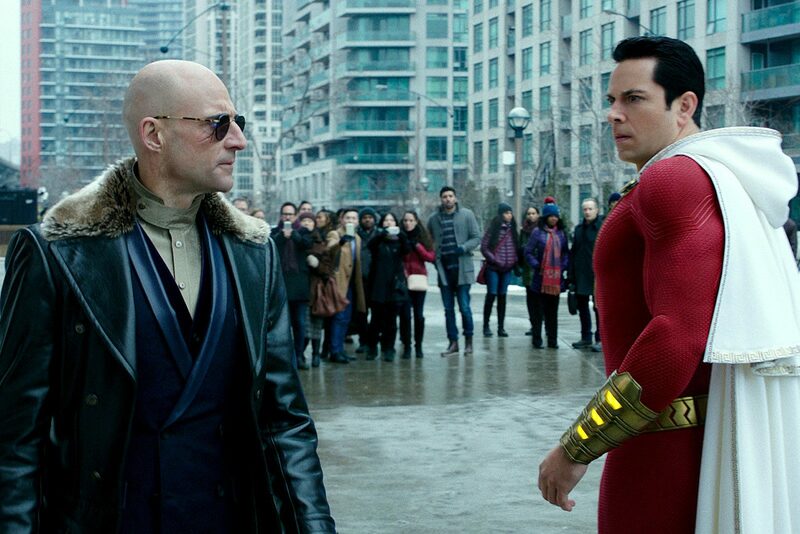 Pursuing Billy is Dr. Thaddeus Sivana (Mark Strong), a scientist obsessed with obtaining Shazam’s power for himself. Having been deemed unworthy by the wizard as a boy for failing to resist the Sins’ temptations, adult Sivana chooses instead to embrace the demons- quite literally- into his left eye. Strong is enjoyably sinister but just empathetic enough as Sivana, a man whose childhood insecurities have driven his maniacal pursuit of power. He’s nowhere close to Killmonger or Thanos, however, and the Sins themselves— portrayed as grotesque, Ghostbuster hellhound-looking demons— are egregiously computer-generated. They, along with the action effects, feel somewhat artificial against the real-world backgrounds, even if this never compromises the fight scenes’ sense of fun and adventure. Also, there’s one scene where Sivana gets revenge in a boardroom that’s pretty damn creepy for a PG-13 entry. However, Billy’s personal journey remains at the heart of this film. All he wants is to find the one person he thinks truly loves him, only to find a larger circle of people who want him in the present. This vulnerability makes Billy compelling and sympathetic, even when he uses his powers for cheap or selfish tricks rather than heroism. He exists in a world where DCEU versions of Superman and Batman are both idolized and commercialized but, as Philadelphia’s new resident hero, the stakes are just low-key enough to feel personal. So when Billy goes for a money shot transformation in the third act, it feels like an epic coming of age moment. As for whether Shazam! succumbs to your average “seen it before” superhero clichés- yes, but they never feel like a deal breaker. Outside a number of uncanny VFX effects, the final battle goes on for a bit too long and inadvertently reminds me how artificial the Sins look up close. Yet I’m perfectly willing to forgive the film for these problems due to its adaption of one particular scene from the New 52 storyline that I didn’t think would actually make the final cut. Without spoiling anything, holy moly, is it awesome. And the mid-credit introduction of that pure Silver Age Shazam villain? Now that took some cojones. Shazam! doesn’t break any barriers in the superhero genre but it’s another much-needed win for DC. It’s goofy, charming, full of laughs, and possesses a big enough heart. And no, I will not be making any comparisons between this movie and Captain Marvel to fuel a stupid troll controversy. They’re both entertaining films so watch and decide for yourself. This is an enjoyable popcorn flick that will hopefully persuade Warner Bros to mass produce more DC films of the “fun” variety so that the DCEU remains afloat. Even if you’re unfamiliar with Shazam’s history, you’ll have fun with this one.